郑文龙, 张辉, 王德征, 张爽, 庞硕, 李昌昆, 江国虹. Zheng Wenlong, Zhang Hui, Wang Dezheng, Zhang Shuang, Pang Shuo, Li Changkun, Jiang Guohong. Zheng Wenlong, Zhang Hui, Wang Dezheng, Zhang Shuang, Pang Shuo, Li Changkun, Jiang Guohong. Analysis on long-term trends of cervical cancer mortality and years of life lost in Tianjin, 1999-2015[J]. Chinese Journal of Epidemiology, 2019, 40(1): 64-69. Abstract: Objective To analyze the mortality and years of life lost (YLL) trends of cervical cancer in Tianjin, and provide references for the research and prevention programs of cervical cancer. Methods Mortality rate, standard mortality rate, cumulative rate (0-74 years-old) and truncated rate (35-64 years-old) of cervical cancer from 1999 to 2015 were calculated. The annual percentage change of the mortality rate and YLL rate were analyzed by using Joinpoint regression analysis, and the trend in different age-groups were analyzed. Results From 1999 to 2015, 1 741 cases died of cervical cancer in Tianjin, the average crude mortality rate was 2.15/100 000. The average age-standardized rate of (ASR) China and ASR world were 1.47/100 000 and 1.50/100 000 respectively. The average YLL was 3 347.97 person-years. Deaths occurred in those aged 0-34 years, 35-64 years and 65 years and over accounted for 3.10%, 57.84% and 39.06% of the total, respectively. The mortality rate of cervical cancer in urban area was higher than that in rural area, with a ratio of 1.37:1 between urban area and rural area. The age-specific mortality rate of cervical cancer during 1999-2015 increased with age. Two peaks of mortality rate were observed in those aged 50 years and aged 75 years, during 2014-2015. From 1999 to 2011, the mortality rate of cervical cancer was stable (APC=-0.2%, P=0.80), but there was a rapid increase from 2011 to 2015 (APC=21.6%, P < 0.01). But group aged 20-49 years, it showed an upward trend from 1999 to 2015 (APC=6.9%, P < 0.01). For group aged 50-69 years, it showed a downward trend from 1999 to 2007 (APC=-9.2%, P < 0.01), and an upward trend from 2007 to 2015 (APC=14.5%, P < 0.01). For group aged 70 years and over, it showed a downward trend from 1999 to 2009 (APC=-10.2%, P < 0.01), but the difference in the mortality were not significant from 2009 to 2015 (APC=7.8%, P=0.10). Since 2008, the YLL rate of cervical cancer in group aged 50-70 years had exceeded that in group aged >70 years and the gap gradually widened. Conclusions There had been a rapid increase trend of cervical cancer mortality since 2011 in Tianjin. Women aged 50-70 years were the main group of life loss. World Health Organization. Globocan 2012: estimated cancer incidence, mortality and prevalence worldwide in 2012[EB/OL].[2015-02-23]. http://globocan.iarc.fr/Default.aspx. 乔友林, 赵宇倩. 宫颈癌的流行病学现状和预防[J]. 中华妇幼临床医学杂志:电子版, 2015, 11(2): 1-6. 江国虹, 张辉, 李威, 等. 天津市利用全死因监测系统开展吸烟归因死亡的研究[J]. 中华流行病学杂志, 2016, 37(3): 381-383. 曹亚光, 沈孝来. 天津人口实录[M]. 天津: 天津科学技术出版社, 1998. Cao YG, Shen XL. Demographic Data of Tianjin[M]. Tianjin: Tianjin Science and Technology Press, 1998. 天津统计局. 天津统计年鉴[M]. 北京: 中国统计出版社, 1997. Tianjin Statistics Bureau. Tianjin Statistical Yearbook[M]. Beijing: China Statistics Press, 1997.
WHO. WHO methods and data sources for global burden of disease estimates 2000-2015[R]. Global Health Estimates Technical Paper WHO/HIS/IER/GHE/2017.1. Geneva: WHO, 2017. 赫捷, 陈万青. 2016中国肿瘤登记年报[M]. 北京: 清华大学出版社, 2017: 154. He J, Chen WQ. Chinese cancer registry annual report 2016[M]. Beijing: Tsinghua University Press, 2017: 154. 田立慧, 于德亮. 2009-2011年天津渤海地区妇女HPV普查结果分析[J]. 中国妇幼保健, 2013, 28(1): 53-54. Tian LH, Yu DL. 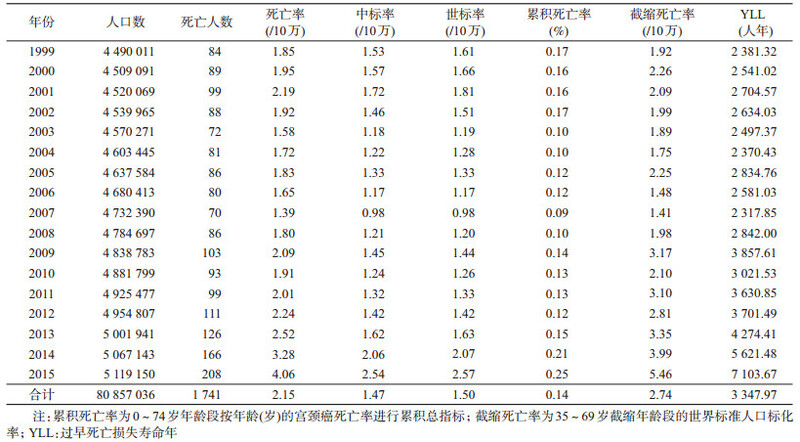 Analysis about general survey of HPV in women from 2009 to 2011 in Bohai area, Tianjin[J]. Mater Child Health Care China, 2013, 28(1): 53-54. 李威, 王德征, 沈成风, 等. 天津市2007-2013年宫颈癌发病趋势及流行特征分析[J]. 中华流行病学杂, 2016, 37(5): 699-701. 胡尚英, 郑荣寿, 赵方辉, 等. 1989至2008年中国女性子宫颈癌发病和死亡趋势分析[J]. 中国医学科学院学报, 2014, 36(2): 119-125. 李霓, 郑荣寿, 张思维, 等. 2003-2007年中国宫颈癌发病与死亡分析[J]. 中国肿瘤, 2012, 21(11): 801-804. Li N, Zheng RS, Zhang SW, et al. An analysis of incidence and mortality of cervical cancer in China, 2003-2007[J]. China Cancer, 2012, 21(11): 801-804. 白小龙, 管楠楠, 李文辉, 等. 2000-2015年沈阳市宫颈癌死亡现况及趋势分析[J]. 现代预防医学, 2007, 44(22): 4096-4099. Bai XL, Guan NN, Li WH, et al. Analysis on current mortality and trend of cervical cancer in Shenyang city between 2000 and 2015[J]. Mod Prev Med, 2007, 44(22): 4096-4099. 包鹤龄, 刘韫宁, 王黎君, 等. 中国2006-2012年子宫颈癌死亡情况与变化趋势分析[J]. 中华流行病学杂志, 2017, 38(1): 58-64. 向小庆, 叶红. 彩色多普勒在宫颈癌诊断及疗效评价中的应用进展[J]. 现代肿瘤医学, 2013, 21(3): 653-655. 李赛, 谢幸. 2000-2009年浙江地区宫颈癌临床病理特征与治疗现状研究[C]//2014浙江省妇产科学、围产医学学术年会暨妇产科常见疾病规范化治疗新进展、围产医学现状与进展专题学术论坛论文汇编.绍兴: 浙江省医学会妇产科学分会, 浙江省医学会围产医学分会, 2014: 578-579. Li S, Xie X. Clinicophathological characteristics and treatment status of cervical cancer in Zhejiang province during 2000-2009[C]//Proceedings of the Chinese medical doctor association conference on obstetricians and gynecologists 2014. Shaoxing: Zhejiang Provincial Medical Association Gynecology and Obstetrics Branch, Zhejiang Provincial Medical Association Perinatal Medical Association, 2014: 578-579.